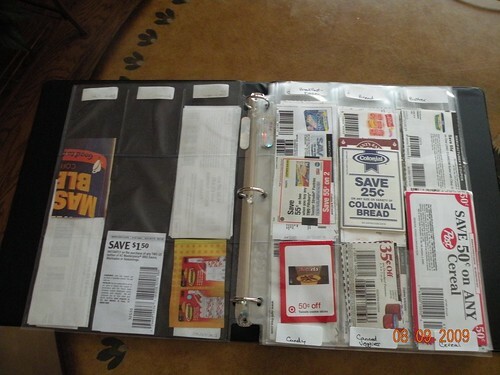 One of the most important things when couponing is being organized. The following is a post I wrote on August 11, 2009…shortly after I started couponing hard-core. You know I have been enjoying my couponing. The only thing I haven’t enjoyed is hunting for coupons. Oh, not the coupons that are in the supplements each week. These are kept in folders. The coupons I’m referring to are the ones I print from the internet, peelies (the ones stuck to items on the shelves), and the ones that Queen Couponer (my mother-in-law) sends me. 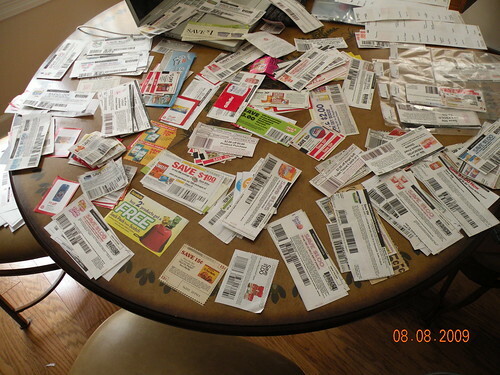 I can’t tell you the amount of time I’ve spent over the last few weeks…hunting for particular coupons. So, I enlisted Chicky’s help…well…make that “bribed” her to help. That’s a whole lotta coupons, eh? Can you imagine going through them one by one to find something in particular? The day before we worked on this project, Chicky and I had gone to Hobby Lobby, armed with a 40% coupon, where I purchased a package of plastic baseball card pages. I found file labels in my closet and wrote the names of different categories on them…two per label (one on the left and one on the right side of each label). I used my paper cutter to cut a straight line through the middle of them. I tried my best to alphabetize the categories, and I did a fairly decent job of it. My original intent was to use all nine slots on each page; however, it didn’t take me long to realize that many of my coupons are long, and some of my coupons would be hidden, so I had to come up with another plan. 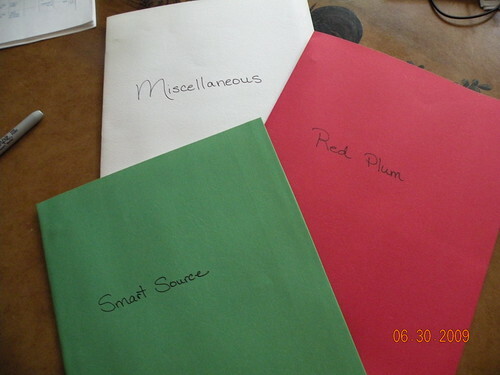 I decided to place labels at the tops and bottoms of each page. I placed the coupons for the top labels in the middle slots. This allows me to see their category names. 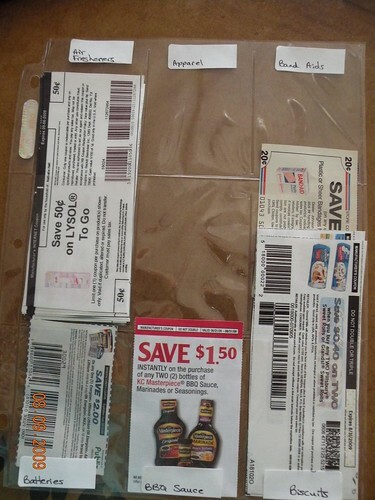 The bottom labels correspond with coupons placed in the bottom-most slots. The coupons cover the middle slots, but it doesn’t really bother me because I can see those labels, which are at the very top of each page. Another thing I discovered…you can only use one side of these pages! Thankfully, my package came with a lot of pages, so I have plenty left over. I added four new categories towards the end of this project, so I just stuck them on the last page. It bugs me a little that they aren’t in alphabetical order, but oh well. I was not about to shift the labels and coupons. All-in-all, this was at least a two-hour job. I just know the time will have been worth it the next time I plan a big shopping trip. Thanks for posting this. I have been thinking of giving this a try.